Early copper artifacts, first decorative, then utilitarian, were undoubtedly hammered out from “native copper,” pure copper found along with copper-bearing ores in a few places around the world. By 5000 BC, the dawn of metallurgy had arrived, as evidence exists of the smelting of simple copper oxide ores such as malachite and azurite. About 4000 BC, gold appeared on the scene as man’s second metal. By 3000 B.C., silver and lead were being used and the alloying of copper had begun, first with arsenic and then with tin. The blend of copper and tin forms bronze. For many centuries, bronze reigned supreme. It was used for plows, tools of all kinds, weapons, armor, and decorative objects. The Bronze Age ended at about 1200 BC, with the general collapse of the ancient world and the interruption of international trade routes. The supply of tin in particular dried up and the Iron Age was ushered in, not because iron was a superior material, but because it was widely available. The deliberate alloying of iron with carbon to form the first steels did not occur for centuries. Today copper is still used in a wide variety of applications. Practically everything we use today involves copper in one way or another. Building construction has been the largest consumer of copper followed by electrical and electronic components, transportation equipment, consumer and general products and industrial machinery and equipment. Although fiber optics has replaced some communication lines and plastic pipe has replaced some water lines, copper use has still increased as world demand has increased. Here are a few descriptions and applications of copper that have been of interest to me.. 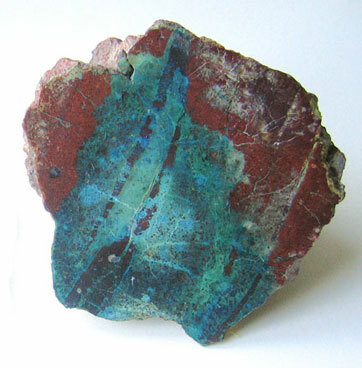 Ore from Arizona features the green color copper carbonate called Malachite. Rich copper minerals like this boost the copper content of this bonanza grade ore.
“Float” copper is found throughout the “Copper Country” of Michigan and nearby states. Glacial movements thousands of years ago altered the geologic deposits of the native copper by tearing and scouring the land. Copper, along with other rocks, gravel and sand were constantly tumbled and deposited over large areas in the Upper Midwestern United States. Exposure to the soils, water and air has oxidized the copper surface a bright green. 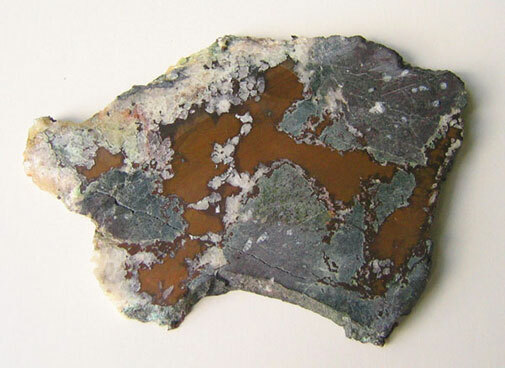 The natural oxidation color provides a good contrast to the copper in this cross section. 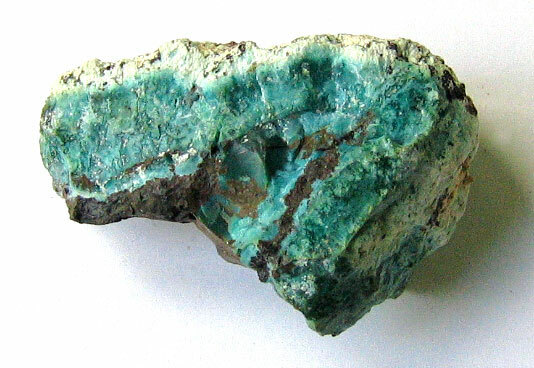 Minerals are concentrated into a slurry that is about 15% copper. Waste slag is removed. Water is recycled. Tailings (left-over earth) containing copper oxide are routed to leaching tanks or are returned to the surrounding terrain. The percentages of tin, aluminum, nickel, zinc and phosphorus that make up alloys such as brasses and bronzes are relatively small but they degrade the electrical conductivity of the resulting alloy much more than their compositional percentage would indicate. However, there are instances where the superior tensile and machining characteristics like brass make it a better choice than copper as long as the sectional areas are increased proportionately to achieve the same electrical conductivity that a copper part would have for the same application. 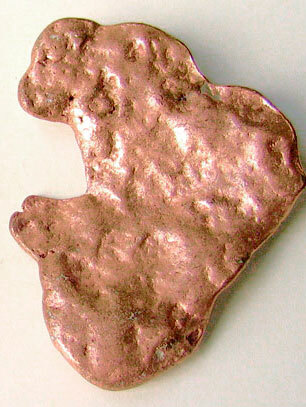 Size for size, however, copper is exceeded only by silver among the materials commonly used for electrical applications. Some power lines still use copper, especially for lower transmission voltages. In the above picture, this old power cable and porcelain insulator is shown with the original copper wire. The surface of the copper wire has turned to a green patina after many years of exposure to the elements. Pyrex and ceramic insulators like this could often be seen along railroad lines. The insulator is 3-1/4” in diameter and 3-1/4” high. The U-shaped top was often used in windy areas where a firm hold was needed. The U is where the cable was placed and a separate piece of copper wire was wrapped around both insulator neck and cable to further hold it in place. The wide skirt was to allow water to drip off and reduce the conductive path to a power pole and the ground. This was important as the lines could be carrying 3,000 volts or more. When it rained or there was high humidity, enough heat could be generated that would crack an ordinary glass insulator. Surprising as it might be, aluminum conductors reinforced with steel (known as ACSR) are primarily used for medium and high voltage overhead lines and may also be used for some overhead services to individual customers. Aluminum conductors are used as it has the advantage of lower resistivity/weight than copper, as well as being cheaper. The price of copper spiked in the mid 1960s. As a result, aluminum wire became relatively less expensive and could be substituted for use in homes. This was the older 1350 series alloy that was designed for power transmission lines. Because the conductivity of aluminum is less than copper (about 61%), the aluminum wire had to be larger to handle the same amount of current. Typical connections to outlets were usually made by wrapping the wire around the screw terminals and then tightening the screw. Over time, many of these terminations to aluminum wire began to fail due to improper connection techniques and dissimilar metals. The resulting connection failures were due to increased contact resistance and that generated heat when powering an electrical load. This was high enough in some cases to start a fire in the home resulting in death. A home with aluminum wiring installed prior to 1972 probably has the older 1350 series alloy that was designed for power transmission. Today, the most common wiring is copper and is still my preferred choice but aluminum and silver wire can also be used with approved connectors and installation techniques. Leaching & electrowinning or smelting and electrolytic refining. They are commonly available. 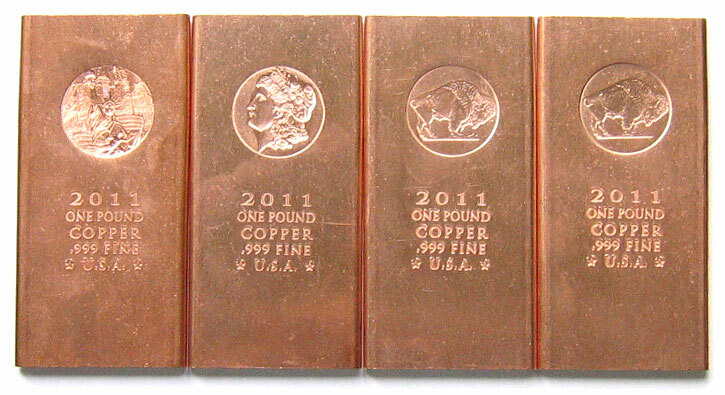 One ounce copper rounds are also available measuring 1-1/2” in diameter. C 10200 is known as Oxygen-Free (OF). Its conductivity rating is no better than the more common C11000 grade mentioned above. Howevr, it has a 0.001% oxygen content, 99.95% purity and minimum 100% IACS conductivity. For the purposes of purity percentage, silver (Ag) content is counted as copper (Cu). 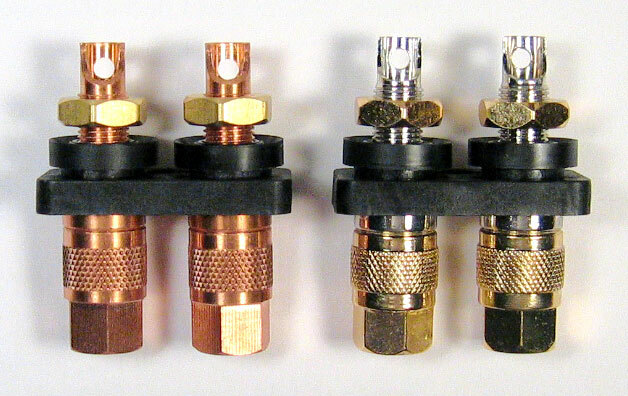 Many owners of high-end audio and video equipment value “oxygen free” copper. Behind this demand is the belief that it will have enhanced conductivity or other electrical properties that are significantly advantageous to audio signal transmission. However, as indicated above, most C11000 common copper sold today meets or exceeds the 101% IACS conductivity and overlaps C10200 “oxygen free” that has a minimum of 100% IACS conductivity. In practice, there is no significant difference in conductivity between all three of the grades as far as audio use is concerned. However, for industrial use, C10100 OFE copper is valued for purity and used for such applications as plasma deposition, semiconductor manufacture and particle accelerators. Cardas Audio Ltd., a high-end audio company makes a variety of wires and connectors. These two terminals are made of solid copper. The bar stock they use has a specified purity of 99.957% that qualifies it as a category C10200 “oxygen free” copper. The terminals at the left are Cardas #CCBP S and are solid copper. The terminals at the right are Cardas #CCGR S and are the same but have a thick plating of silver and a flash of rhodium over the silver. Rhodium and silver have very low electrical resistance and rhodium has high corrosion resistance. The high reflectance of rhodium may add to the luster of the subsequent gold plating that is added to the knurled portion. The copper nuts are gold plated. The black insulators are glass-filled nylon. Here are two older fuses made by Jefferson Electric. The upper fuse is for 500 volt 400 amp service. The lower one is for 250 volt 100 amp service. The blade contacts in both fuses are solid copper. However, the blades in the larger one are plated with silver. The end caps are brass. Lightning rods have been around since the days of Ben Franklin and more than a hundred patents have been filed since the 1850’s. Copper has been the main conductor in many of these devices but aluminum and other materials have also been used. 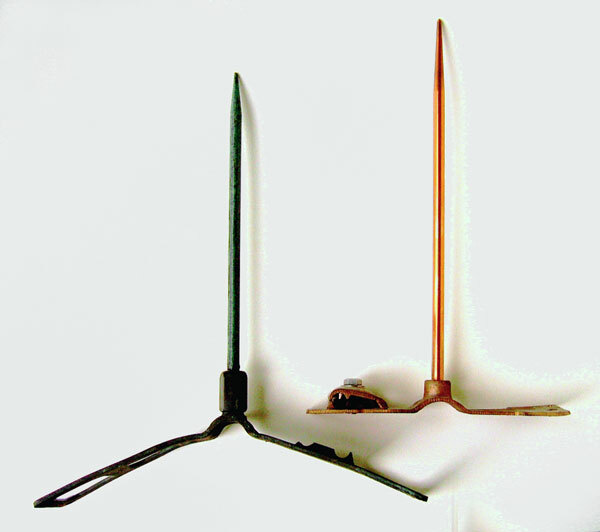 The two rods and stands shown are solid copper. The older one on the left has been on a barn roof for 50 plus years or more and the copper now has a dark green patina to the surface. The rod on the right is new. A heavy gauge, braided copper wire can be attached to a clamping device on the stand that runs to a grounding device, usually a copper or copper plated steel rod. Part of the clamp is missing on the old stand. The clamp on the new stand is held with a stainless steel bolt and washer. In addition to barns and houses, rods are also used in trees or other things in need of protection. More information about lightning can be found on my lightning page. Here is a 1978 penny after some cleaning and a 2008 penny as found. Although there is more copper in nickels, dimes and quarters, the monetary value of these coins is still higher than value of the copper in them. The penny was the coin where the value of the copper was more than the face value of the coin. As a result, in late 1982, the content of the penny was changed from 95% copper and 5% zinc to 2.5% copper and 97.5% zinc. The value of zinc, of course, was much lower than copper. The new coin is identical in size and appearance but is lighter at 2.5 grams compared to 3.11 grams for copper cents issued before 1982. This modification saved the government an estimated $25 million in metal costs every year. 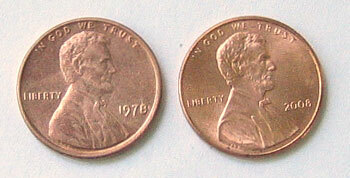 The last mostly-copper cents were produced by the Denver Mint on October 22, 1982. As of January 22, 2010, a pre-1982 cent contains $0.021698 worth of copper, which makes it an attractive target for melting by people wanting to sell the metal for profit. The US Mint, which is a part of the US Department of the Treasury, in anticipation of the business of melting down US pennies and US nickels for profit, implemented new regulations on December 14, 2006 which criminalize the melting of pennies and nickels and place limits on export of the coins. Violators can be punished with a fine of up to $10,000 and/or imprisoned for a maximum of five years. Here is a picture of young horseshoe crabs measuring only a couple of inches long, found dead along a beach in Chatham in Cape Cod. 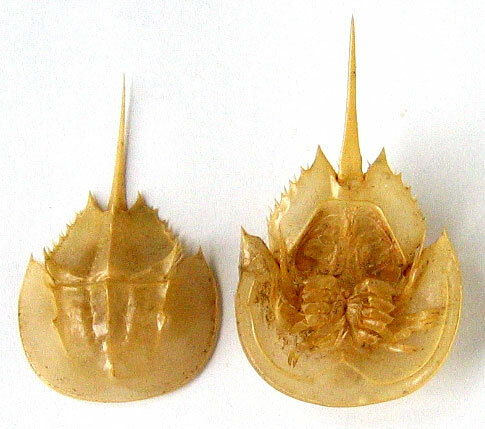 Horseshoe crabs do not have hemoglobin in their blood like humans. In Humans and most other vertibrates, hemoglobin in the red blood cells is the iron-containing oxygen-transport mechanism. It is what transports oxygen from the lungs to the rest of the body where it releases the oxygen for cell use, and collects carbon dioxide to bring it back to the lungs. In horseshoe crabs, lobsters, crabs, shrimp, scorpions most mollusks and other insects, hemocyanin is used to carry oxygen. It contains two copper atoms that reversibly bind a single oxygen molecule (O2). Oxygenation causes a color change between the colorless Cu(I) deoxygenated form and the blue Cu(II) oxygenated form. Hemocyanins carry oxygen in the hemolymph fluid. They are second only to hemoglobin in frequency of use as an oxygen transport molecule. Unlike the hemoglobin in red blood cells, hemocyanins are not bound to blood cells but are instead suspended directly in the hemolymph fluid. Horseshoe crabs have been proven to benefit cancer research. Because of the copper present in hemocyanin, horseshoe blood is blue. Their blood contains amebocytes, which play a role similar to white blood cells for vertebrates in defending the organism against pathogens. Amebocytes are used to make a compound, which is used for the detection of bacterial endotoxins. Endotoxins are known to inhibit the growth of cancer cells. Therefore, the ability of the LAL test to detect cancer cells may lead to a new type of cancer therapy using endotoxins. Another substance found in horseshoe crab blood may have the potential for diagnosing leukemia. This substance reacts with red and white human blood cells, including cancerous white blood cells in leukemia patients. Harvesting horseshoe crab blood involves collecting and bleeding the animals, and then releasing them back into the sea. Most of the animals survive the process; mortality is correlated with both the amount of blood extracted from an individual animal, and the stress experienced during handling and transportation. Estimates of mortality rates following blood harvesting vary from 3% to 15%. More text and pictures about copper will be added as my research continues. Any comments, corrections, or additions are welcome.